Here's the bigger picture and left click to see it bigger. 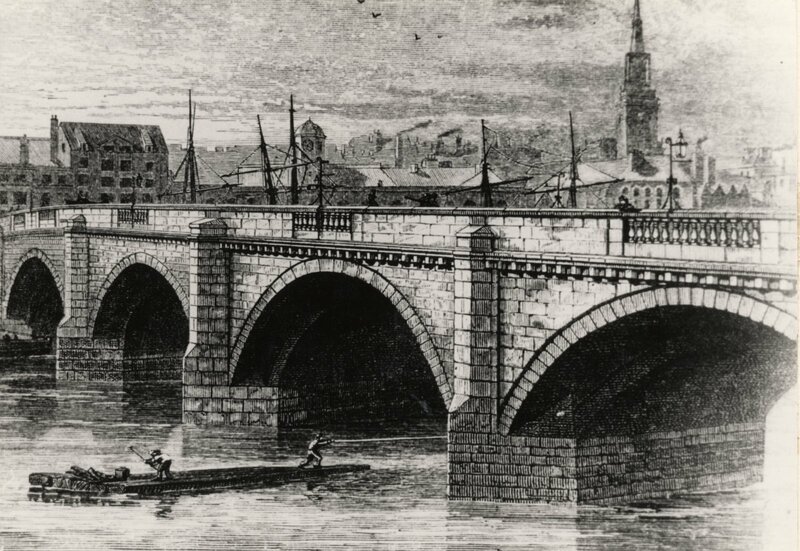 There may have been more than one bridge at Newcastle in the middle ages but the first of which anything is known was probably built in the late 12th century replacing a bridge destroyed by fire in 1248. This was a stone arched bridge with huge piers built on the site of the Roman bridge and was a joint enterprise between Newcastle and the Bishop of Durham and the Bishop's arms appeared on a tower at the Gateshead (in County Durham) end of the bridge. Towers with gates and a drawbridge and portcullis reflected the bridge's military significance and a chapel was a feature not unusual for the times. A prison was also incorporated and several shops and houses, particularly at the Gateshead end, completed its picturesque appearance. The upkeep of the bridge was divided between the town of Newcastle and the Prince Bishops of Durham and boundary stones marked their limits of responsibility. Rivalry between the town and the Bishops caused friction on occasion. 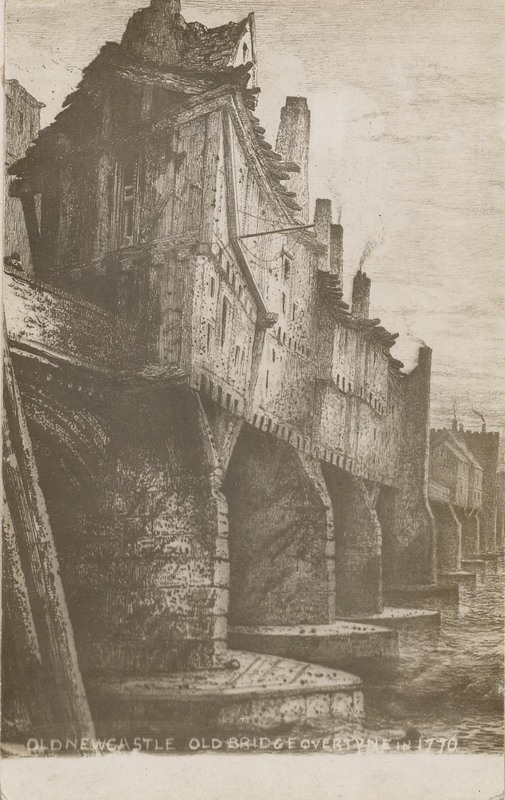 Newcastle eventually controlled six arches to the Bishop's four. Frequent repairs were needed over the centuries, the last being effected in 1770 after an adverse report on its condition. 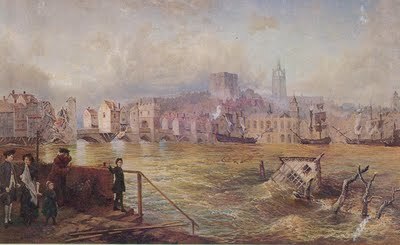 But one year later the bridge succumbed to the devasting great floods which followed three days of heavy rain which eventually carried parts of the bridge away on the morning of Sunday November 17. The middle arch collapsed to be followed by two more. Shops and houses fell or were rendered unsafe and six people lost their lives. More arches collapsed in the period to December 7 and this completed the destruction of the old bridge. An arch remains under the Swing Bridge roadway at the Newcastle side. 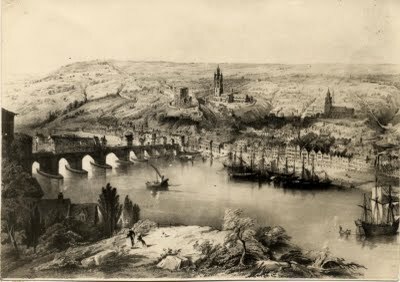 In 1781, a new stone bridge across the Tyne was completed. sold at from 6d. to 8d. per pound. 1834 January 28. Newcastle Gateshead and the neighbourhood was visited by a severe storm, of wind and rain, as were all the western parts of the county. From the circumstance of the Tyne rising to an enormous height and overflowing its banks, the whole of the district below Blaydon, including Derwenthaugh, Scotswood, Dunstan, &c., was completely under water, and in many of the houses it was nearly up to the second floor. 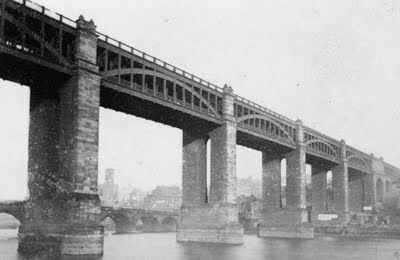 only one ever built above ie west of the Tyne bridge, was launched at Chatham (western end of Pipewellgate), in the presence of a large assemblage of spectator*. She was called The Frolic, and intended for the Baltic trade. of the same kind was perpetrated in September, 1850.
which had been erected across the Tyne, was formally opened! have now commenced to remove the old bridge. The Swing Bridge opened in 1876.
of a numerous party. Mr. Hosking, superintendent of Messrs.
and grain warehouses, and part of the High Level Bridge. mill and warehouses were the property of Mr. Robert Brown. The idea for a bridge at the location of the present Tyne Bridge dates back to 1864, due to concern about the cost of tolls on the High Level Bridge - although the first serious discussions took place in 1883. Committees met over the next three decades, but it wasn't until the early 1920s that proposals were commenced in earnest, boosted by the chance to secure central government funding. On 29 April 1924, Newcastle and Gateshead approved the plans, and the Newcastle upon Tyne and Gateshead (Corporations) Bridge Act was passed on 7 August that year, with an estimated cost of £1 million including land acquisitions. and opened on 10 October by King George V and Queen Mary, who were the first to use the roadway travelling in their Ascot landau. 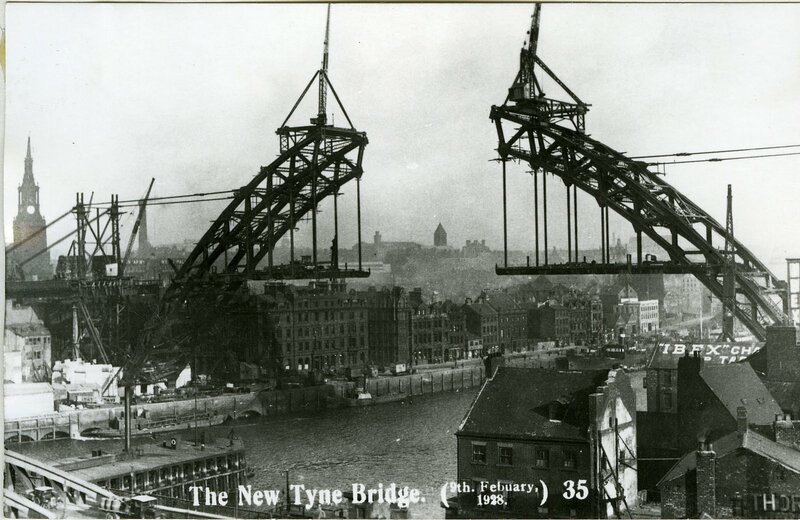 The Tyne Bridge's towers were built of Cornish granite and were designed as warehouses with five storeys. However, the inner floors of the warehouses in the bridge's towers were not completed and, as a result, the storage areas were never used. Lifts for passengers and goods were built in the towers to provide access to the Quayside although they are no longer in use. The first opened in 1871 and carried pedestrians and vehicles. Between 1897 and 1901 the bridge was reconstructed. Hunger marchers crossed the bridge in 1922, without paying the toll. They were protesting about their conditions during the trade depression after the First World War.